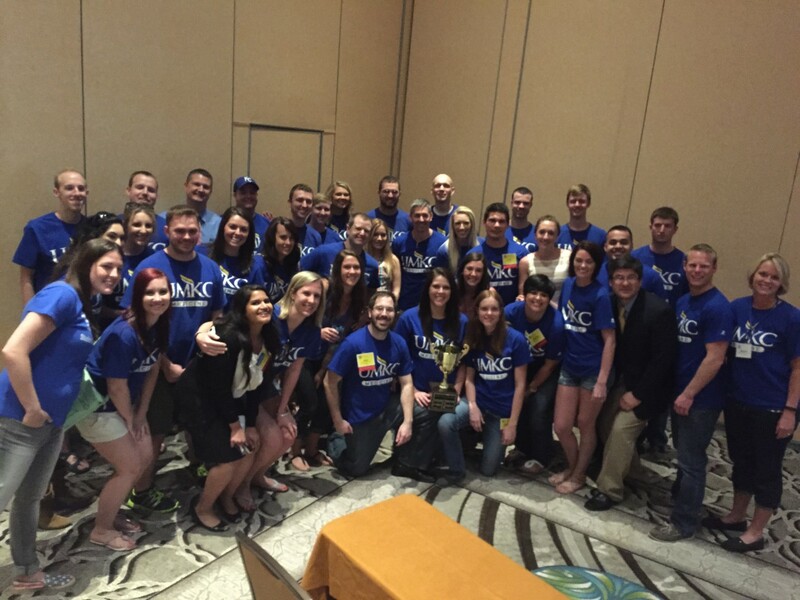 Students from the School of Medicine’s Master of Science in Anethesia program gathered for a group photo at the 2015 American Academy of Anesthesiologist Assistants conference in Orlando, Florida. Students from the School of Medicine’s Master of Sciences in Anesthesia program brought home two major awards from the American Academy of Anesthesiologist Assistants annual conference, April 10-14 in Orlando, Florida. The program, for the second year in a row, brought home the organization’s AAAA Cup, an award given to one program based on its outstanding philanthropy, leadership, involvement, professionalism and participation in the annual Jeopardy competition. 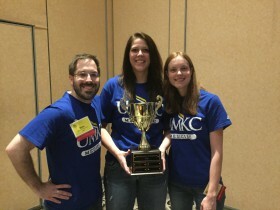 Michael Roth, Kaitlin Hill and Stephanie Woodke display the championship trophy from this year’s AAAA Jeopardy Competition. School of Medicine students also came home as Anesthesiologist Assistants student Jeopardy champions for the second year in a row. The competition pits first-year students from programs across the country. The unique twist for UMKC students, said Melanie Guthrie, M.S.A., AA-C, director of the MSA program, is that while most programs begin their academic year in August, the School of Medicine program beings in January and therefore, first-year students at the School of Medicine have been in classes for just six weeks while most first-year students in other programs have been in classes for six to nine months. A number of students were also recognized for their service on various organization committees. Juveria Nayeem, third-year student, was honored as the outgoing co-chairperson of the student component society. The organization also recognized Joseph Borup, first-year student, as one of the new incoming co-chairs. MSA students spent an evening at the Harvesters food network last fall preparing food and drink packages for local food banks. 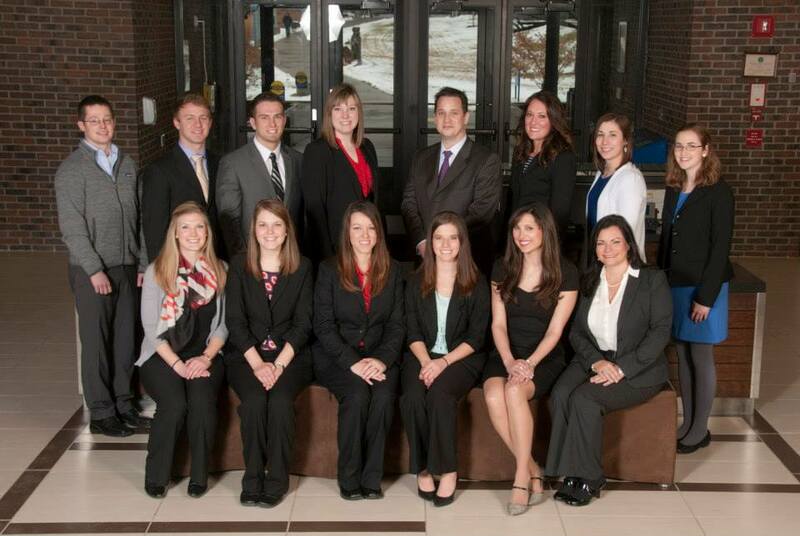 Pictured are (front) Juveria Nyeem, Abby Gezella, Jenna Gaughan, Kyle Harlan; (back) Colin Warnock, Amanda Sharp, Courtney Haanpaa, TJ McManus, Landon Streed, and Tyler Werth. Zombies walked the grounds of a local theme park last fall to raise money for charity. The same folks spent another evening working at a community food network. Those efforts and more earned students from the School of Medicine’s Anesthesiologist Assistants program the first American Academy of Anesthesiologist Assistants (AAAA) Cup during the organization’s annual meeting April 12-15 at Hilton Head, S.C. The AAAA Cup was the first year of a competition that encourages students to become involved in the AAAA. Activities that are part of the competition include donations to the organization’s legislative fund, class attendance at the annual AAAA conference, the AAAA Jeopardy competition and fundraising for the Lifebox Foundation, a global health charity that uses technology and training to make surgery safer in low-resource countries across Africa, Asia, South America and the Western Pacific. Students in anesthesiologist assistants programs across the country participate in the friendly competition as a means of supporting the AA profession. Members of the School of Medicine’s inaugural class of the Master of Medical Science – Physician Assistant program gather for a group photograph following orientation on Jan. 10. A group of 14 students are part of the inaugural class of the School of Medicine’s new Master of Medical Science-Physician Assistant program that kicked off its first classroom activities on Tuesday, Jan 21, with lectures in anatomy and ethics. A joint student orientation with this year’s incoming class of Master of Science in Anesthesia students on Jan. 10 covered information from the Office of Student Affairs covering financial aid and other resources. Students later broke out into individual meetings covering program specific information. School of Medicine Dean Betty Drees, M.D., addressed the two classes during the orientation session. The Physician Assistant program received provisional accreditation status from the Accreditation Commission on Education for the Physician Assistant in September. Provisional status indicates that the plans and resource allocation for the proposed program appear to demonstrate the program’s ability to meet the ARC-PA standards if fully implemented as planned. Provisional accreditation does not ensure subsequent accreditation status and is limited to no more than five years from matriculation of the first class. Kathie Ervie, M.P.A.S., P.A.-C., serves as program director and Beverly Graves, M.D., ’83, is the program’s medical director. Two additional faculty members joined the program in November. 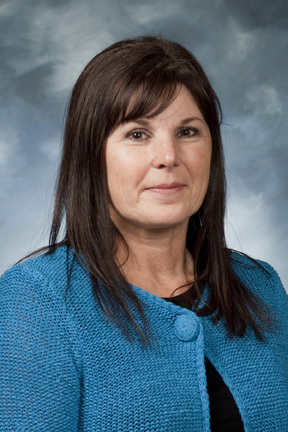 Holli Paulk, M.B.A., M.P.A.S., assistant teaching professor, serves as the program’s clinical coordinator and is involved in curriculum development, lectures and clinical instruction. Brad Dirks, M.Ed., P.A.-C., also an assistant teaching professor, is involved in curriculum development and didactic instruction. The School received nearly 100 applications to be part of its first MMS-PA class and about 40 were interviewed. At least 80 percent of the class each year is expected to come from the instate application pool. The program is looking to accept up to 20 students for its second class in 2015, Ervie said. Class lectures for the PA program will begin on Jan. 21, primarily in a third-floor classroom of the medical school and students will begin early clinical rotations and patient interactions shortly thereafter at Truman Medical Center, Saint Luke’s Hospital, the Kansas City Health Department and other area clinics. The Anesthesiologist Assistant program began in 2008 with an inaugural class of four students. 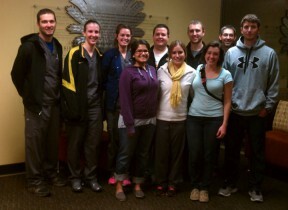 The program has since graduated 24 Anesthesiologist Assistants and will celebrate its fifth graduating class this May. It accepted 13 students into the program this year. The School of Medicine Dean’s Office has announced the appointment of Julie Banderas, Pharm.D., as assistant dean for Graduate Studies and Allied Health. A tenured professor in the department of Biomedical and Health Informatics, Banderas has served as assistant dean for Graduate Studies since 2010. She has been actively involved in developing the School’s initial graduate programs and the corresponding operating procedures and administrative structures. A member of the UMKC Graduate Council and Graduate Officers Committee, Banderas assumes the administrative duties as assistant dean of Allied Health Programs, which include the Master of Science in Anesthesia Program and the Master of Medical Science Physician Assistant Program that was recently approved the University of Missouri Board of Curators in April. Banderas has taught clinical pharmacology at the School of Medicine for 18 years and also teaches courses in Responsible Conduct of Research for the School of Graduate Studies.